This article is about the city. For the classic-winning racehorse, see Shantou (horse). 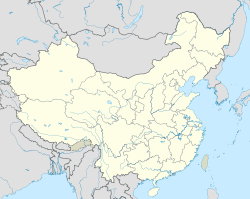 Shantou, formerly romanized as Swatow and sometimes known as Santow, is a prefecture-level city on the eastern coast of Guangdong, China, with a total population of 5,391,028 as of 2010 and an administrative area of 2,064 square kilometres (797 sq mi). From top:Zhengguo Temple, Renmin Square, Queshi Bridge, Shantou overview. 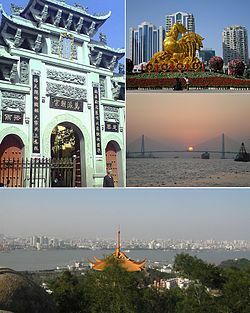 Shantou, a city significant in 19th-century Chinese history as one of the treaty ports established for Western trade and contact, was one of the original special economic zones of China established in the 1980s, but did not blossom in the manner that cities such as Shenzhen, Xiamen and Zhuhai did. However, it remains eastern Guangdong's economic centre, and is home to Shantou University, which is under the provincial Project 211 program in Guangdong. Shantou was a fishing village part of Tuojiang Du (鮀江都), Jieyang County during the Song dynasty. It came to be known as Xialing (廈嶺) during the Yuan dynasty. In 1563, Shantou became a part of Chenghai County in Chao Prefecture (Chaozhou). As early as 1574, Shantou had been called Shashanping (沙汕坪). In the seventeenth century, a cannon platform called Shashantou Cannon (沙汕頭炮臺) was made here, and the place name later was shortened to "Shantou". Locally it has been referred to as Kialat. Connecting to Shantou across the Queshi Bridge is Queshi (礐石) which had been known by the local people through the 19th century as Kakchio. It was the main site for the American and British consulates. Today the area is a scenic park but some of the structures from its earlier history are somewhat preserved. In 1860, Shantou was opened for foreigners and became a trading port according to Treaty of Tientsin. 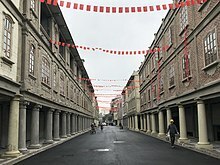 It became a city in 1919, and was separated from Chenghai in 1921. 1922 saw the devastating Swatow Typhoon, which killed 5,000 out of the 65,000 people then inhabiting the city. Some nearby villages were totally destroyed. Several ships near the coast were totally wrecked. Other ones were blown as far as two miles inland. The area around the city had around another 50,000 casualties. The total death toll was above 60,000, and may have been higher than 100,000. In the 1930s, as a transport hub and a merchandise distribution centre in Southeast China, Shantou Port's cargo throughput ranked third in the country. A brief account of a visit to the city in English during this period is the English accountant Max Relton's A Man in the East: A Journey through French Indo-China (Michael Joseph Ltd., London, 1939). On 21 June 1939, Japanese troops invaded Shantou. Japanese forces occupied Shantou until 15 August 1945. The Communist People's Liberation Army captured Shantou on 24 October 1949, 23 days after the People's Republic of China was founded. 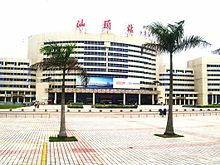 With higher-level administrative authority, Shantou governed Chaozhou City and Jieyang City from 1983 to 1989. Shantou is located in eastern Guangdong with latitude spanning 23°02′33″ – 23°38′50″ N and longitude 116°14′40″ – 117°19′35″ E; the Tropic of Cancer passes through the northern part of the city, and along it there is a monument, in fact the easternmost in mainland China, at 23°26′33″N 116°35′20″E﻿ / ﻿23.44240°N 116.58885°E﻿ / 23.44240; 116.58885. The highest peak in the city's administration is Mount Dajian (大尖山) on Nan'ao Island, at 587 m (1,926 ft); the highest peak on the geographic mainland is Mount Lianhua (莲花山), at 562 m (1,844 ft) in Chenghai District. The city is located at the mouths of the Han, Rong (榕江), and Lian Rivers. Shantou is 187 miles (301 km) north of Hong Kong. Shantou has a monsoon-influenced humid subtropical climate (Köppen Cwa), with short, mild to warm winters, and long, hot, humid summers. Winter begins sunny and dry but becomes progressively wetter and cloudier. Spring is generally overcast, while summer brings the heaviest rains of the year though is much sunnier; there are 8.2 days annually with 50 mm (1.97 in) of rainfall. Autumn is sunny and dry. The monthly 24-hour average temperature ranges from 14.7 °C (58.5 °F) in January to 29.1 °C (84.4 °F) in July, and the annual mean is 21.53 °C (70.8 °F). The annual rainfall is around 1,618 mm (64 in), about 60% of which occurs from May to August. With monthly percent possible sunshine ranging from 28% in March to 58% in July and October, the city receives 1,979 hours of bright sunshine annually. Shantou is a prefecture-level city. It has direct jurisdiction over six districts and one county. 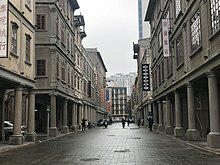 As of 2003, the district of Haojiang was established out of Hepu and Dahao which had been merged, and the district of Jinping Shengping and Jinyuan; Waisha and Xinxi Town, part of former Chenghai City, was merged into Longhu District; Chenghai City became Chenghai District; Chaoyang City was divided and became Chaoyang and Chaonan District respectively. Shantou's economy is medium by Guangdong standards. Manufacturing accounts for a large and increasing share of employment. Canning, garments, lithography, plastic, and toys are some of the principal products. Toy manufacturing is the city's leading export industry, with 400 million U.S. dollars worth of exports each year. Guiyu, a populous town in Chaoyang District, is the biggest electronic waste site on earth. Health-environmental issues incurred have concerned international organizations such as Greenpeace. In 2000, the biggest tax fraud in the history of the People's Republic of China was uncovered, estimated worthy of 32.3 billion yuan. In 2017, the analyzed data of Shantou GDP is approximately 230 billion yuan($35.4 billion USD). With an area of 2.34 km2 (0.90 sq mi), Shantou Free Trade Zone lies at the south part of Shantou city. It was ratified by the State Council of the People's Republic of China and founded in January 1993, and it formally came into use on December of the same year after its supervision installations were checked and accepted by the General Administration of Customs. It has been comprehensively developing export processing, storage, international trade, finance and information industry. Its goal is to establish a modernized international zone that is open to overseas by drawing experience from international free trade zones. Shantou is one of the most densely populated regions in China. Former Chaoyang City was China's most populous county-level administrative region, with 2.4 million inhabitants. 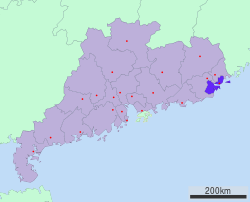 Shantou has direct jurisdiction over six districts and one county, and the six urban districts of Shantou have a population of 5,330,764. With it and the surrounding cities of Jieyang and Chaozhou, the metropolitan area known as Chaoshan covers an area of 10,404 km2 (4,017 sq mi), and had a permanent population of 13,937,897 at the end of 2010. Its built up area spread of 12 districts and Raoping county was home to 12,785,241 inhabitants as of 2010 census. [better source needed] The metropolitan area population was estimated by the OECD (Organisation for Economic Co-operation and Development) to be, as of 2010[update], 12 million.. This is de facto the fourth built-up area of China after Pearl River Delta, Shanghai-Suzhou-Wuxi-Changzhou megacity and Beijing. Most residents are linguistically Teochew. 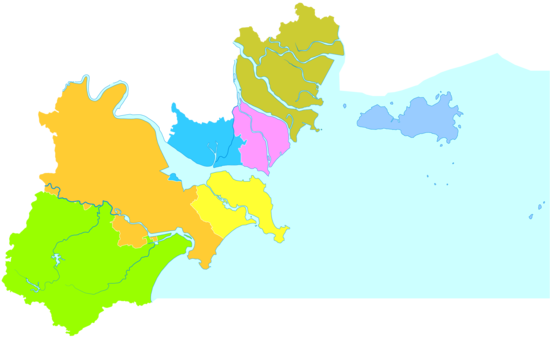 Teochew dialect is a variant of Min Nan (Hokkien-Taiwanese) spoken in the neighbouring Southern Fujian and Taiwan. There are also Hakka, popularly known as Half-Hakka (半山客), living mainly in Chaoyang District and Chaonan District, although they speak Teochew on a daily basis and practise Teochew culture. Thanks to the Mandarin-medium education system, most people, especially the younger generations, can speak Mandarin fluently. Thanks to Cantonese dialect TV and labor migrations to the Pearl River Delta, Cantonese is widely spoken as a third language by the younger generations. Governmental statistics show that 2.16 million overseas Chinese have roots in Shantou, with significant populations of Teochew people residing in Thailand and Cambodia, which constitute a majority of Thai Chinese and a majority of Chinese Cambodians. This is demonstrated by the unusually high number of international direct flights between Bangkok and Shantou. In addition, there are at least two Teochew-speaking air hostesses on board each China Southern flight between Shantou and Bangkok. The Teochew presence, furthermore, is evident in Singapore and Malaysia; Johor Bahru, a coastal city situated at the latter's southernmost tip, is known as 'Little Swatow', due to the majority local Chinese populace is dominantly Teochew and as well as the second largest group of the local Chinese population in Singapore. Shantou people share the same culture with other Teochew. The tea-drinking tradition widely practised in town is a classic instance. According to China Daily, Shantou people "drink more tea than anyone else in China, in total 700 million yuan (US$87.5 million) each year". Most of the population in Shantou is non-religious or practices traditional folk religions, Buddhism, Taoist rites, or worship of gods and ancestors. About 2% of the population belongs to an organised religion, with 40,000 Protestants, 20,000 Catholics and 500 Muslims. St. Joseph's Cathedral of Shantou is the cathedral of the Roman Catholic Diocese of Shantou. The public hospitals in the Shantou metropolitan area are operated by the Government of Shantou. Management of these hospitals and other specialist health facilities are coordinated by Shantou Board of Health. Shantou's electricity is provided entirely by China Southern Power Grid, postal service operated by China Post. Shantou is one of the most important international telecommunications ports in China. Four international submarine communications cables land at Shantou submarine cable landing station, including APCN 2, China-US Cable Network, SMW3 and South-East Asia Japan Cable System (SJC). China Telecom, China Unicom and China Mobile provide fixed lines, broadband internet access and mobile telecommunications services there. Public transportation is provided by bus, ferry, bike sharing system and taxi. Residents also travel by private car and motorbikes. A metro system is planned with construction of 3 lines (Lines 1, 2, and 3) commencing in 2018 and opening of the system planned in 2020. Shantou previously had its own civil airport, Shantou Waisha Airport. It was formerly the main airport serving the Shantou until nearby Jieyang Chaoshan Airport was opened on 15 December 2011. Shantou Waisha Airport became a military airbase since then and all civilian flights were transferred to the newly built airport in Jieyang. Taxi is the usual way to travel between the airport and the city proper. The taxi fare is around 60 RMB. Airport-Downtown Shantou shuttle charter is also suggested. Based in Shantou, Shantou Airlines Co. operated by China Southern Airlines has a 15 aircraft fleet in service. Shantou Railway Station (Now is under construction for upgrading to High Speed Railway (CRH) station. There are 3 railway stations which serve Shantou: Chaoshan Railway Station and Chaoyang railway station which lie on the Xiamen-Shenzhen Railway line, and Shantou Railway Station which lies on the Guangzhou–Meizhou–Shantou Railway and is under construction for the Guangzhou-Shanwei-Shantou 350 km/h high speed railway. Tropic of Cancer Symbol Tower (北回归线标志塔; Běihuíguīxiàn biāozhìtǎ): The Tropic of Cancer slips through Centipede Mountain, which is 20 kilometers away from the city properly. Cultural Revolution Museum (文革博物馆; Wéngé bówùguǎn): The country's only museum dedicated to the Cultural Revolution. 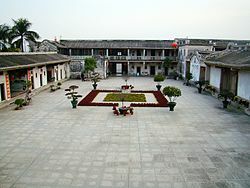 Shantou Museum (汕头博物馆; Shàntóu bówùguǎn): An art museum. Shantou Founding Museum (汕头开埠博物馆; Shàntóu kāibù bówùguǎn): This history museum is devoted to the establishment of Swatow (Shantou) as a treaty port in the 19th century, not to be confused with Shantou Museum. In 1912 Swatow had four newspapers, all in Chinese. They were Han Chao Pao, Ming Chuan (People's Rights), Ta Fung Pao (The Typhoon), and Ta Tung Pao (Eastern Times). In 2018, Shantou Metropolis Daily Post and Shantou Special Economic Zone Evening News both stopped their traditional newspaper business and transform into e-newspaper newspapers. Meanwhile, the Shantou Daily (Municipal) keep providing both newspaper service and e-newspaper service for Shantou citizens and other readers. Education is overseen provincewide by the Guangdong Education Bureau. Public primary and secondary schools provide education free. Many notable Chinese come from Shantou or their ancestral home is Shantou. Ji Haipeng,Chairman and Chief Executive Officer of Logan Property Holdings Co, Ltd.
Dhanin Chearavanont(1939-),Senior Chairman of CP Group, Thailand’s largest private company and Forbes ranked. Sir Li Ka-shing GBM KBE JP (1928–; Chaozhou), tycoon, the chairman of the board for CK Hutchison Holdings. ^ Willis E. Hurd (August 1922). "North Pacific Ocean" (PDF). Monthly Weather Review. pp. 433–35. Retrieved 5 July 2007. ^ a b "Notes on weather in the other parts of the world" (PDF). Monthly Weather Review. p. 437. Retrieved 14 June 2007. ^ a b c "The Selga Chronology Part II: 1901–1934". Universidad Complutense Madrid. Retrieved 2 May 2007. ^ "NOAA's Top Global Weather, Water and Climate Events of the 20th Century" (PDF). NOAA. Archived (PDF) from the original on 28 June 2007. Retrieved 28 June 2007. ^ 汕头历次区划调整大事记（1949-2003）. southcn.com. 14 March 2003. ^ 中國汕頭政府－歷史沿革 (in Chinese). Shantou People's Government. Retrieved 24 December 2009. ^ McGinniss, Joe. Never Enough: A Shocking True Story of Greed, Jealousy and Murder. Simon & Schuster, 25 December 2012. ISBN 1471108384, 9781471108389. Google Books PT284. ^ 汕头市国土资源局. 《汕头市土地利用总体规划（2006–2020年）》 (in Chinese). 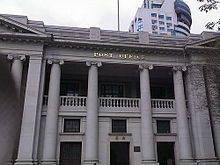 ^ 中华人民共和国国家统计局 (December 2012). 《中国2010年人口普查分县资料》 (in Chinese). China Statistics Press. ISBN 978-7-5037-6659-6. ^ 汕头——曼谷航班有了潮籍空姐. 民航资源网. 2002. Retrieved 5 March 2007. ^ 汕头宗教的主要特征. Archived from the original on 3 September 2014. Retrieved 29 August 2014. ^ "Shantou Submarine Cable Landing Station". Submarine Cable Networks website. Retrieved 24 February 2012. ^ 揭阳潮汕机场今晨起飞首架航机. Netease (in Chinese). 15 December 2011. Retrieved 23 January 2013. ^ United States Bureau of Foreign and Domestic Commerce, p. 187. ^ "Sister Cities and Friendly exchange cities, the official website of the Shantou city". Retrieved 30 October 2009. ^ "Sister Cities Kishiwada, the official website of the Shantou city". Retrieved 30 October 2009. ^ "Sister Cities St.John's, the official website of the Shantou city". Retrieved 30 October 2009. ^ "Sister Cities Can Tho, the official website of the Shantou city". Retrieved 30 October 2009. ^ Liuxi (16 February 2012). "First Cultural Exchange after Shantou and Johor Bahru becomes Sister Cities". Shantou Daily. Shantou Government. Archived from the original on 30 June 2015. Retrieved 1 July 2015. ^ "Sister Cities Pyongtaek, the official website of the Shantou city". Retrieved 30 October 2009. ^ "Sister Cities Fairfield, the official website of the Shantou city". Retrieved 30 October 2009. ^ "Sister Cities Orlando, the official website of the Shantou city". Retrieved 30 October 2009. ^ "Sister Cities Los Angeles, the official website of the Shantou city". Retrieved 30 October 2009. Wikimedia Commons has media related to Shantou. Wikivoyage has a travel guide for Shantou.